It’s been under the radar, no one seemed to know about these thefts until it happened to them. Now there’s awareness and a solution; the media and the police are alerting the public, and Xtralock® was created to solve the problem. - it was a wake up call when my seats were stolen in a very upscale parking structure - thieves are thieves no matter where you park. It’s become an opportunity for criminals to make thousands of dollars very quickly. A few seconds of work can earn a couple thousand dollars in payout for a thief willing to take a risk, and it’s spreading like wildfire. So much so that it is now common to see the topic addressed regularly on police blogs and bulletins across the nation. There have been a couple of “locking” mechanisms developed to stop the thieves but unfortunately they’re easily removed with wire-cutters or a wrench. Thieves figured that out quickly and now arrive equipped with the tools they’ll need in hand. When he learned about this growing problem, Sabino Cici, a locksmith specializing in the auto industry, took action and developed Xtralock®, a locking system that makes it nearly impossible for thieves to remove the seats. The locking system features a lock with no shackle for thieves to cut through. Cici decided that in addition to being secure, the locking system should be visible to would be thieves to deter them from even trying. He even included window decals as part of the system to alert thieves that the vehicle is protected by Xtralock®. 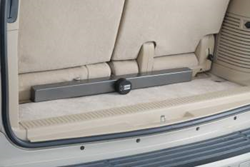 Xtralock Inc. is a privately held company devoted to creating a high quality locking system to lock out criminals and protect third row seat vehicles. Consumers can order Xtralock® by visiting http://www.xtralock.com.